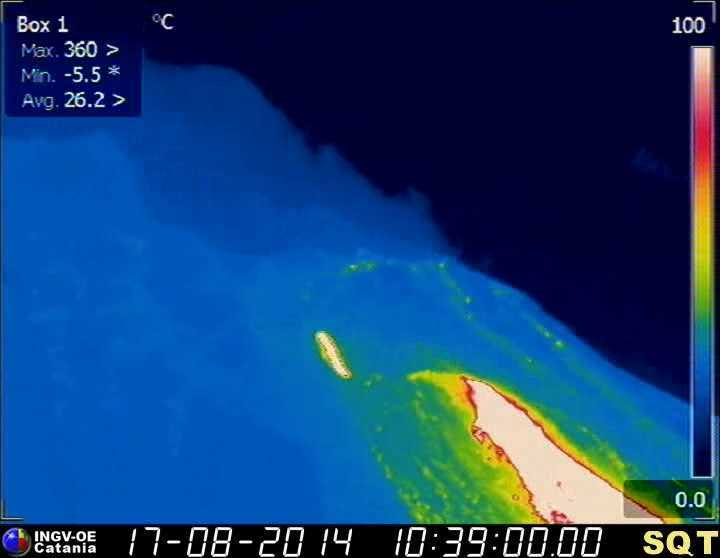 Stromboli (Eolian Islands, Italy): No significant changes have occurred during the past days. The lava flow continues to be active from the vent at the base of the NE cone, but the effusion rate is slowly decreasing overall. Etna (Sicily, Italy): Effusive / explosive activity from the New SE crater gradually declined and ceased over the weekend. The latest eruptive episode is now over. Bárdarbunga (Iceland): An intense earthquake swarm started yesterday under Bárðarbunga volcano, located under the northwestern part of the Vatnajökull ice cap. It is continuing at the moment and accompanied by elevated harmonic tremor. This might indicate a subglacial eruption at the volcano, but this needs yet to be confirmed. The last eruption of Bárðarbunga volcano was in 1797, while another eruption in 1910 took place at neighboring Hamarinn volcano. Mayon (Luzon Island): A small lava dome is present at the top of the volcano. During a field survey on 12 August, PHIVOLCS scientists observed a new lava dome, approx. 30-50 m high. It is not known when exactly the dome had grown, but it seems likely that it was relatively recently. In the past 2 months, the volcano experienced weak and short phases of inflation, suggesting pulses of rising magma. In addition, sulfur dioxide emissions had been higher than normal during the past 2 weeks. However, no incandescence was observed during the past 4 months. As a precaution, PHILVOLCS decided to raise the alert level of the volcano from 1 to 2. An exclusion zone of 6 km radius around the summit is in place.